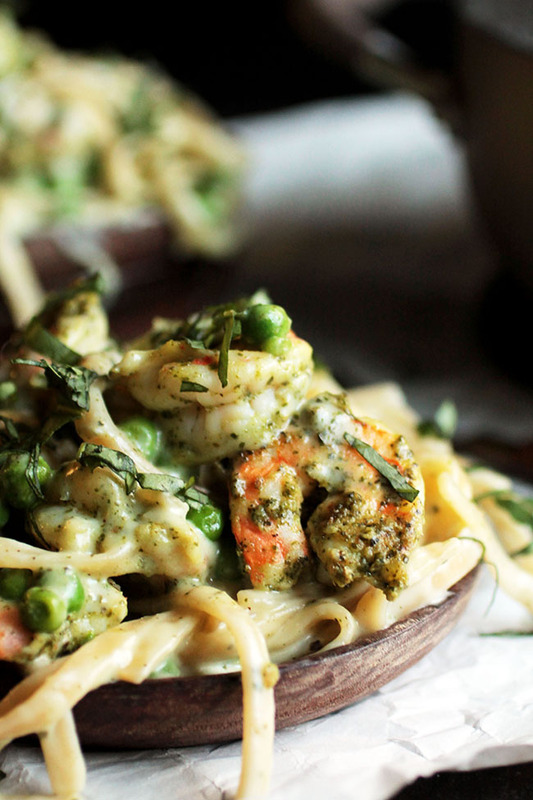 Mix up a classic shrimp fettuccine Alfredo recipe with this easy parmesan pasta sauce, pesto, and sautéed shrimp. Happy 2016! (And also wait, WHAT? Because I swear we were all just freaking out about Y2K liiiiiiike, yesterday). I know that January is usually the time of salads and vegetables and blah blah blah, but it’s a Monday. And (even worse than that) it’s a Monday after a big ol’ holiday break and I woke up this morning to find the whole world covered in snow (which is the worst because snow is the worst) so it only took me about 10 seconds to decide that today is a day for CARBS and CHEESE. 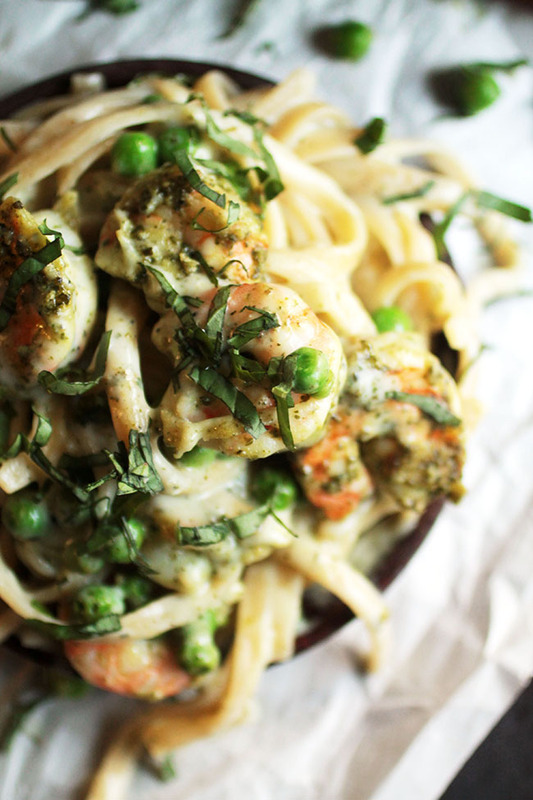 But I diiiiid put peas in this shrimp fettuccine. Sooooooooo… health food? 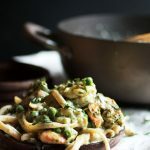 I love this shrimp fettuccine alfredo because it’s close enough to a traditional fettuccine alfredo to still be comfort food-y, but the pesto, peas, and a bit of goat cheese give it just enough of a twist to be new and interesting. 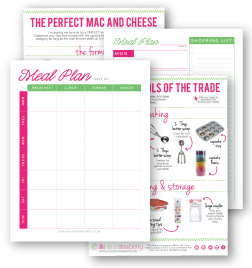 You can absolutely substitute parmesan cheese for the goat cheese if you like, or swap the peas out for any other veggies you’ve got on hand. 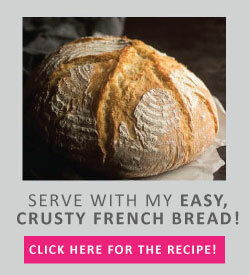 This would also be great with broccoli or some caramelized onions. Swap some chicken for the shrimp if you prefer or nix the seafood entirely for a vegetarian option. PS – when you’re looking for shrimp for this pasta, look for Wild American Shrimp (not sponsored, I’m just a fan). I buy American because 1) U.S. shrimp supports an incredible community of American fishermen and -women (shrimpers are the coolest. For realz) and 2) it lets me avoid shrimp that was processed with slave labor. Slavery continues to be an issue in the shrimp industry, particularly with shrimp imported from Thailand. Read up if you aren’t familiar with this issue, and check out Wild American Shrimp’s website if you need any help tracking down some tasty U.S. shrimp! Also, I promise I will make you a salad soon to cancel out all this pasta. But also, fair warning that “soon” might be, liiiiiiiiike, April. HAPPY MONDAY! 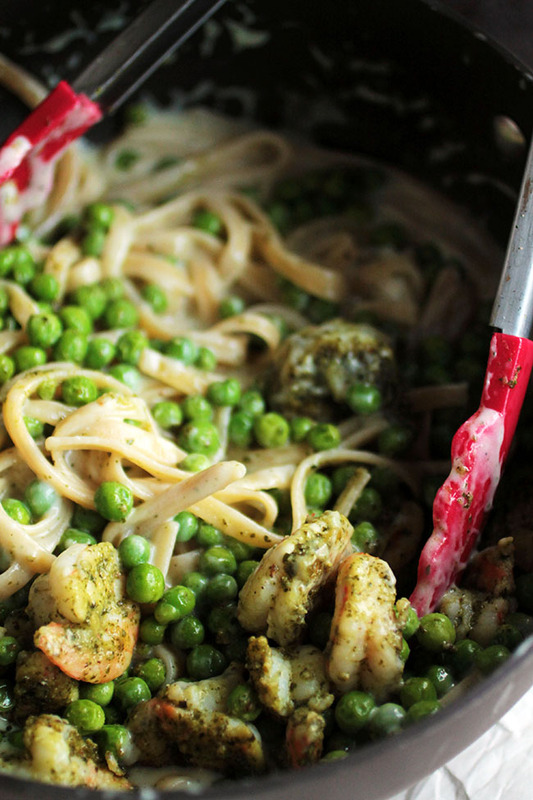 Easy, creamy parmesan pasta sauce with fettuccine, shrimp, peas, and pesto. Cook fettuccine in very salty water until al dente. Drain and set aside. While the pasta cooks, cook the shrimp. 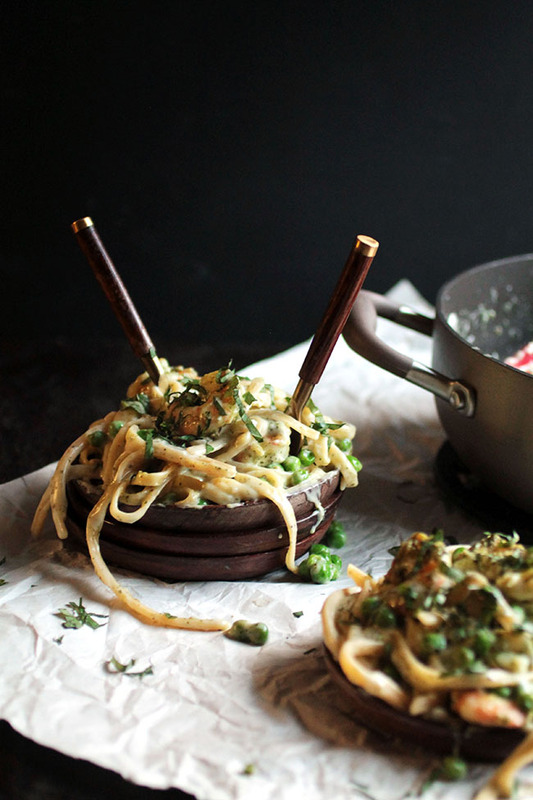 Heat pesto in a medium-sized skillet over medium heat. Add the shrimp and toss to coat. Cook, stirring frequently, for 3-5 minutes until shrimp is pink and cooked through. Keep an eye on the pesto so it doesn’t burn! Remove cooked shrimp from heat and set aside. Return empty pasta pot to stove. Add butter to pot and melt over medium-high heat. Add flour to butter and whisk together to form a roux. Cook for 1 minute. Slowly add milk to roux, whisking constantly to work out any lumps. Cook, whisking occasionally, for about 10 minutes, until milk has thickened significantly. Remove sauce from heat and stir in goat cheese, peas, salt, and pepper. Stir until cheese has melted completely. Add cooked pasta and cooked shrimp to the sauce and toss with a pair of tongs to combine everything. Garnish with fresh chopped basil (optional) and serve immediately. You can use parmesan cheese in place of (or in addition to!) the goat cheese for a more traditional Alfredo-type sauce. 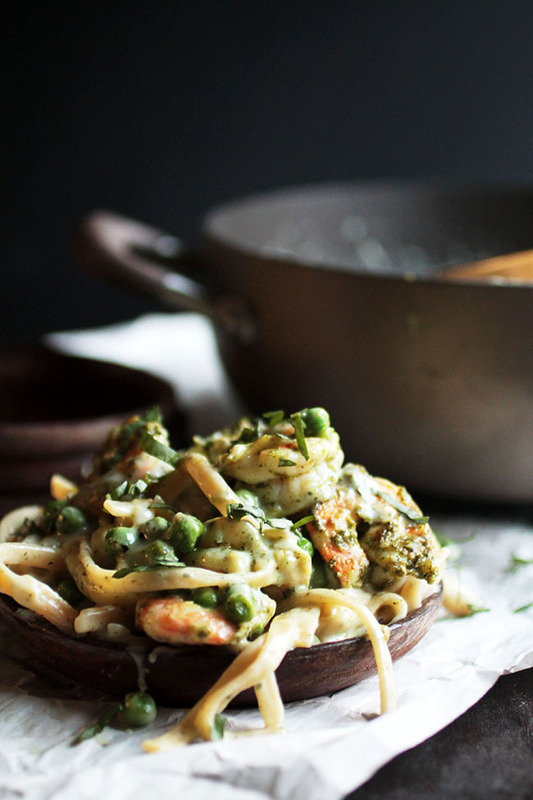 I wish I’ve your pea and pesto shrimp fettuccini before the Reyes festival here in Madrid so ill cook and serve it to my friends.